Perhaps we should get Max Aub’s astonishing biography out of the way first: born to a German father and a French Jewish mother who immigrated to Spain at the beginning of World War One, he took Spanish citizenship at the age of eighteen. As a socialist he supported the Republican government during the Spanish Civil War to the point he was regarded as an enemy of the state by Franco, who denounced him as a German Jew to the Vichy government in France in 1940. He was imprisoned in France and then Algeria, but managed to escape to Mexico where he remained for the rest of his life. He wrote prolifically – novels, plays, screenplays – but is largely untranslated into English. Field of Honour, translated by Gerald Martin, is only the second of his novels to appear – sixty-six years after its original publication. 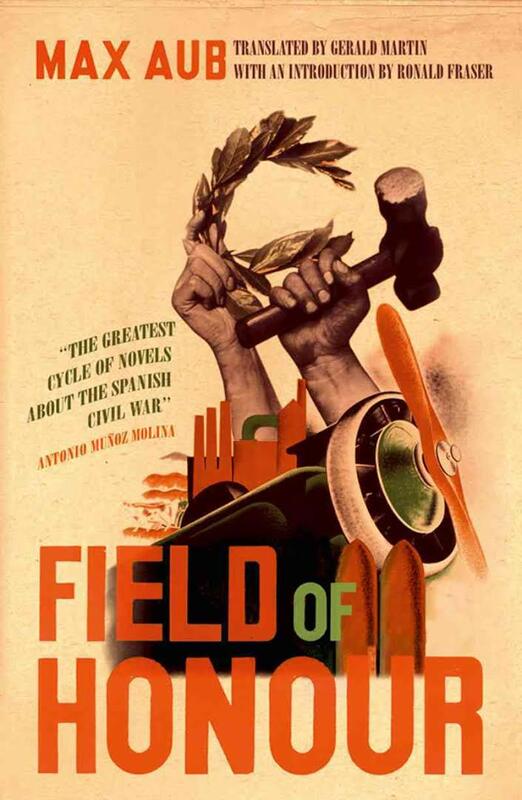 Field of Honour is only the first part of a six volume series (The Magic Labyrinth) which tells the story of the Spanish Civil War – which means, of course, that the conflict is only just beginning by its end. It was published by Verso in 2009, and there’s no sign of the second volume being available any time soon. (This raises the question of whether it can be fairly judged as a stand-alone novel, though it seems that the main character, Rafael Serrador, is not followed throughout the sequence). Aub’s purpose in Field of Honour is to set the scene leading up to the outbreak of the civil war – a time of competing ideologies. However, he cleverly seeks to establish Serrador’s character before immersing him into the political maelstrom that is 1930s Barcelona. Unfortunately he is beaten up by the widow’s jealous boyfriend, and then expelled by the jeweller as a trouble maker. At the age of sixteen he heads to Barcelona, finding work in a hardware store. Again he is the victim of circumstances as a newspaper he’s given ridiculing his boss is found in his pocket and he loses his job. It is this casual treatment of labour which feeds the anger which leads him into politics, though this means little more than being is a willing listener to the incessant debating between the various factions in the city. This section probably explains why it has taken so long for Field of Honour to be translated, though Aub’s determination to paint a true picture of events impressed me. In particular, Serrador is far from a hero. Instead he is a confused young man – at one point making lists under the heading ‘What am I?’ – who joins the (right-wing) Falangists, and only ends up defending the Republic at the last moment. In one particularly dark scene, he kills a suspected informer entirely of his own volition. The novel really comes to life in Part Three, when the military coup takes place. Aub dramatizes it through a series of short conversations (much like Shakespeare). It’s an extensive cast of characters (luckily the novel is equipped with a list at the end) but it gives a realistic impression of the constantly changing situation as we move from the view at the top to ground level and back again. The final conflict, securing Barcelona, takes place at the docks, where bales of paper are used to defend the Republican fighters from the machine guns of the remaining Falangist forces. The novel has ended but the war has only begun. How wonderful it would be the see the rest of Aub’s The Magic Labyrinth translated. You are currently browsing the archives for the Max Aub category.